A Web site for teardowns is making selling old houses for demolition easier than ever. NEW YORK (CNNMoney.com) -- In some of the frothiest real estate markets, one of the hottest of trends is the teardown. From Greenwich to Winnetka to Santa Monica, houses young and old, well-maintained and not, are biting the dust so builders can put up something bigger or better. Greenwich had nearly 200 teardowns in 2005, according to data provided by Kolie Sun Chang, a research analyst with Connecticut's Department of Economic and Community Development. BEFORE: This Hinsdale, Ill. teardown looked pretty good. AFTER: Bigger and - perhaps - better. 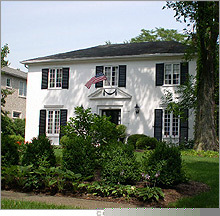 This house belonged to a member of Citizens of Hinsdale Advocating Responsibility in Teardowns. It looked fine, but was in bad condition -- it was sold through Teardowns.com. Some Chicago suburbs consistently recorded teardown rates of between one and two percent of all residential properties through the first half of the 2000s, based on applications filed with the building departments. There are no official figures for the nation overall, but perhaps as many as 100,000 homes a year are sold as teardowns. Aiming to bring together teardown buyer and teardown seller is Teardowns.com. Sellers of teardowns may favor such a Web site because they want an uncomplicated sale. They're aware that the value of the property is in the land, not the house, and they don't want to have to go through a full service broker, with all that implies: open houses, print ads, showings - with 6 percent commissions. For buyers, it's another place to shop. Teardowns.com founder Brian Hickey launched the site in 2001, drawing on his experience as a securities trader to create a marketplace "where buyers and sellers could meet and compete, and at a more realistic fee, 2 percent." Teardowns.com is an Internet-based company but it maintains brick-and-mortar presences. The company has eight offices, three in the Chicago area, and one each in Connecticut, Washington D.C., and, most recently, Westchester County, New York, Southern California and South Florida. The company's staff drives around upscale neighborhoods in mostly older suburbs where they look for poorly maintained or smaller homes on good-sized lots. They contact owners though direct-mail solicitations. Sometimes the mailings are not well received; people can get upset when their beloved family home is being eyed for a wrecker's ball. "Some people tell us to get lost," says Hickey. And sometimes community groups and town fathers object to the whole teardown phenomenon. They say it can ruin the charm of a community by replacing lovely old homes with ostentatious McMansions. 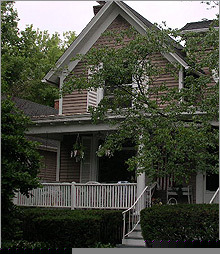 In Hinsdale, Ill., where Teardowns.com started, many of the old families and preservation advocates formed CHART, Citizens of Hinsdale Advocating Responsibility in Teardowns. Hickey is sympathetic to their aims (I grew up in Hinsdale," he says), but he thinks groups like CHART should focus on the kinds of buildings that go up in place of the demolished homes and institute building codes to prevent McMansionization. Hinsdale has done just that by restricting height and specifying setbacks. "They got on it real quickly," says Hickey. Why not? Instead of spending a small fortune to bring the house into saleable condition - at which point someone may have been more interested to buy it as a teardown anyway - the owner was able to get a good price without any muss and fuss. Eventually, Hickey expects to enter the commercial real estate segment. "There are a lot of old strip malls, garages and hotels along commercial roads of these towns," he says, "that could be demolished and replaced with new structures." Hickey says more than 300 homes have been sold through the Web site already. That's a lot for a less than five-year-old brokerage. Hickey's not sentimental at all about the loss of old houses. "Personally, I like a lot of the new houses being built." 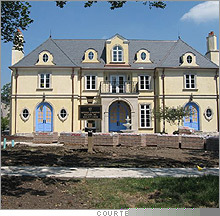 This $135 million home is probably not a teardown. The government sells some bargain homes.